Bought this bookmark for my wife and she absolutely loves it. Thanks CEP for the great service. The product came out just how I'd like. Love your company. Will be purchasing more products of this site including these bookmarks again. 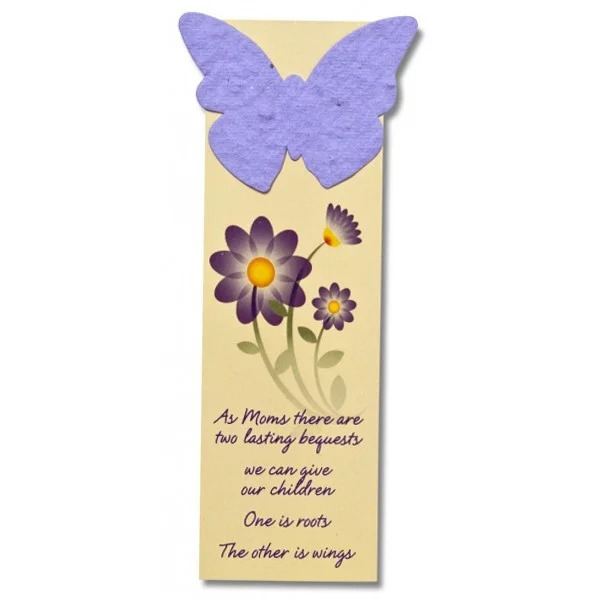 The designs are lovely for this kind of bookmark. A lot of attention was surrounding them when I brought them with me to my last convention. People really do love these eco-friendly bookmarks. Sold out quickly on them at my latest trade show. Will be buying more soon. Thanks CEP. We ordered 5,000 of the seed paper bookmarks for all our students in the entire school. At the end of the year we are going to have a small ceremony, all the students will bury their bookmarks to always have a piece of them here. Love the choice of graphics on these bookmarks! Couldn't decide which one I liked more! Ordered two different bookmarks and was so happy with both! Thank you CEP for your service! The graphics on the bookmark was so distinct. Looked better than I expected. Really good product to promote with they got great reaction at the convention! Great at our fair. 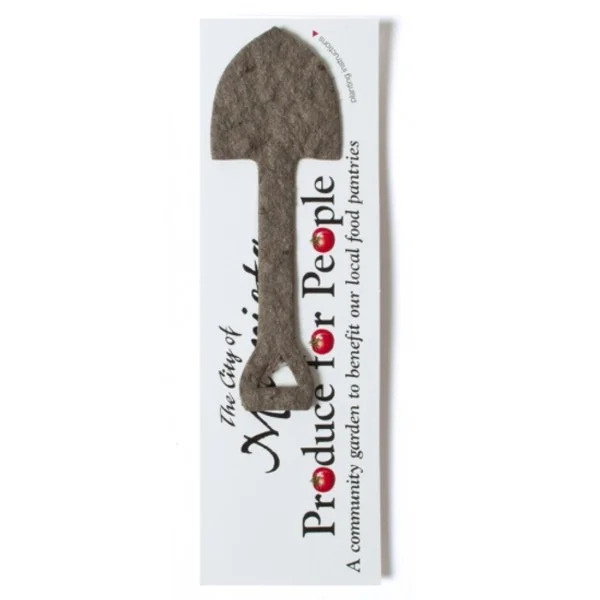 People really take to the idea behind these earth-friendly bookmarks. Nice shape options with these seed paper bookmarks. Eco-friendly too. We handed these out at the convention with our brand on them. Everyone really loved the idea. Great product that represents what an earth friendly consumer truly is! We thought that giving these out at garlic fest would be a great way to promote, and help a great cause. A great way to increase earth friendly awareness into the classroom. I spoke to Ashley at Custom Earth Promos and she really helped me with the whole selection process. There are so many choices it can be overwhelming but I got the help I needed. Very unique item that really supports an earth-friendly way. Top notch products on this site. Just got our bookmarks and couldn't be more pleased with the finished product. 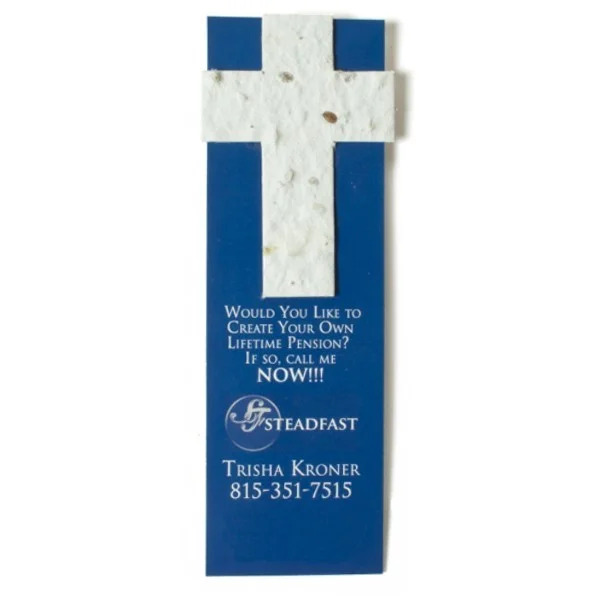 Great options on these bookmarks. 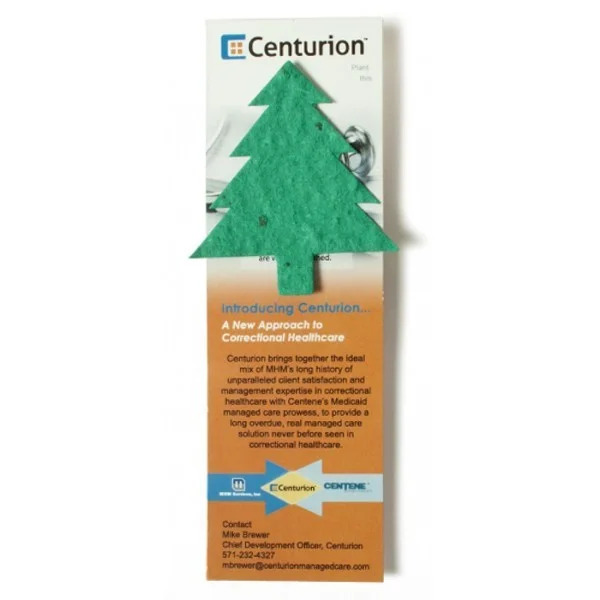 A truly amazing value, our Seed Paper Value Shape Bookmarks collection is the perfect way to affordably promote your eco-aware brand or environmental initiative. Custom Earth Promos takes great pride in providing our customers with budget friendly product options that are fully customizable and guaranteed to capture your message in style, while practicing production methods that conserve resources and reduce the impact on the environment. We provide customers with 22 value shapes to choose from and, as always, the complete freedom to build the bookmark design blueprint from scratch. 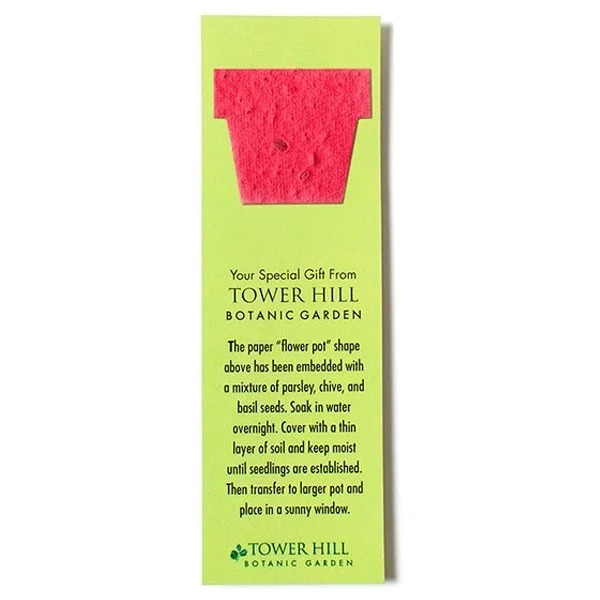 Stand out in the eyes of your customers and stay a step ahead of competitors with eco-attractive, ready-to-plant seed paper bookmarks. We invite you to work side by side with our design experts to design an exclusive blueprint that effectively captures and boldly conveys your brand message and aesthetics. The final product is an eye-catching representation of your business that is 100% recycled, recyclable and beneficial for the ecosystem when planted. By upholding our strict standards of using only the highest quality, USDA-approved, GMO-free, highest germination rate seeds in our industry, Custom Earth Promos ensures your seed paper will grow. Invite customers to plant their seed paper shape under a layer of soil and provide proper water and care. They will soon see a blossoming garden of wildflowers, giving life to your message and serving as a reminder of your brand's eco-ethical initiative. Custom Earth Promos' handmade seed paper begins as a pulp of 100% recycled, undyed post-consumer paper that is then infused with USDA-approved, GMO-free seeds with the highest germination rates and ability to flourish in all US climate zones. This pulp is then laid out to create large sheets of seed paper, manufactured in our 30kW solar power facility. To maintain our highest quality standards and ensure growth, each phase of the production and drying process is meticulously monitored to guarantee no loss of seed germination. Only all-natural soy-based pigments are used to create your recycled cardstock graphic and seed paper color, eliminating eco-impact and guaranteeing a product that is entirely safe for the planet and your consumers. 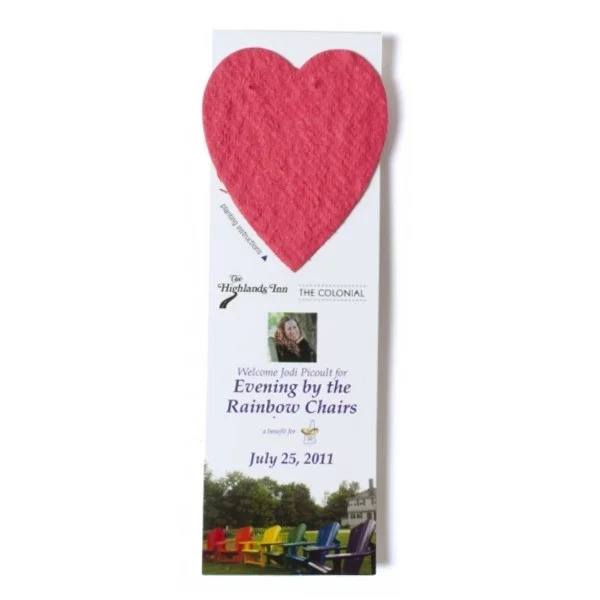 Promote your eco-friendly message in confidence with these affordable and effective eco-friendly bookmarks. 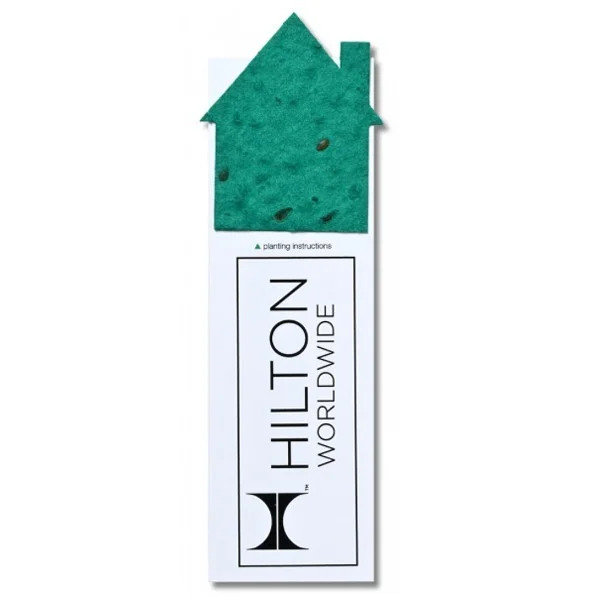 Impress your customers with an eco-ethical invitation to plant their seed paper shape. By encouraging customers to join in taking action for a more sustainable future, brands inadvertently form genuine bonds with participating receivers and strengthen an eco-responsible image. This is a vital obligation to remain successful, as modern day consumers are placing more value on sustainability and waste reduction than ever before. Brands who demonstrate a commitment to sustainability are growing at 4x the rate of those who don't, according to a worldwide study by Nielsen Global Corporate Sustainability. Investing in the eco-responsibility of your brand image will not only increase brand trust and loyalty with current customers but also attract prospects and increase long-term profitability. The seed paper shape you choose can be positioned anywhere on the 1.75" W x 5.5" H 100% recycled cardstock backer. Our in-house design experts will help you build an exclusive design blueprint for your order. First, we will build the custom graphic, message and logo to display on the recycled cardstock. Then, we'll work with you to define the optimal placement, color and seed mix for your chosen value shape. 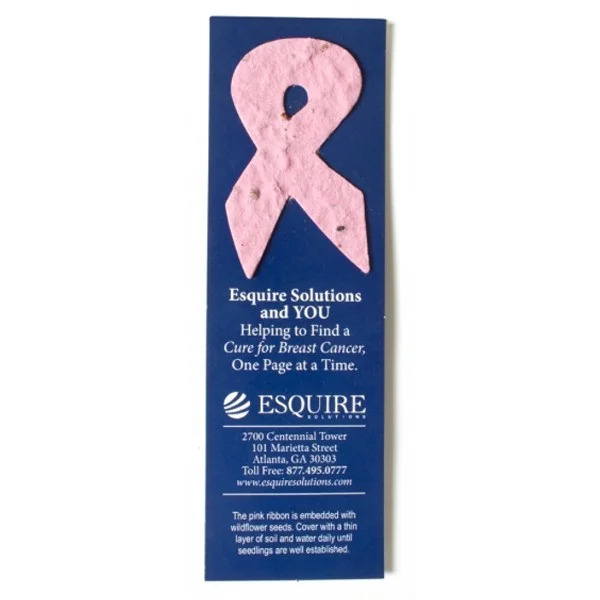 With this plethora of personalization options, the Seed Paper Value Shape Bookmarks are able to adapt to meet the advertising goals and match the brand aesthetics of businesses serving virtually industry. 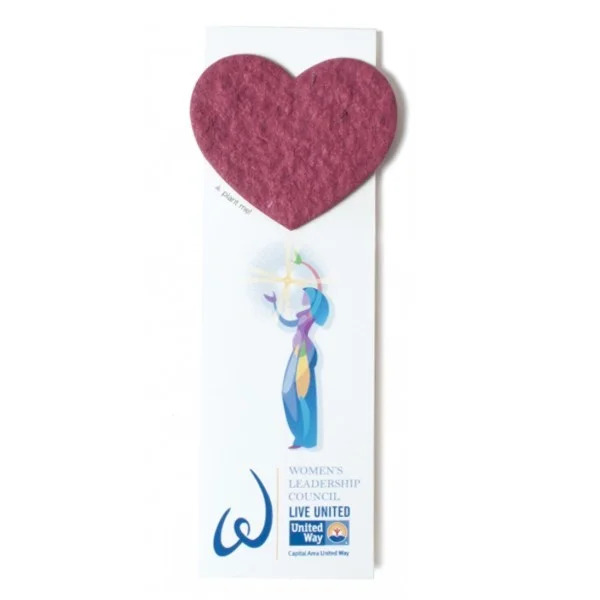 Watch the powerful impact this budget-friendly marketing tool will have as customers respond to their seed paper bookmarks with enthusiasm and appreciation. 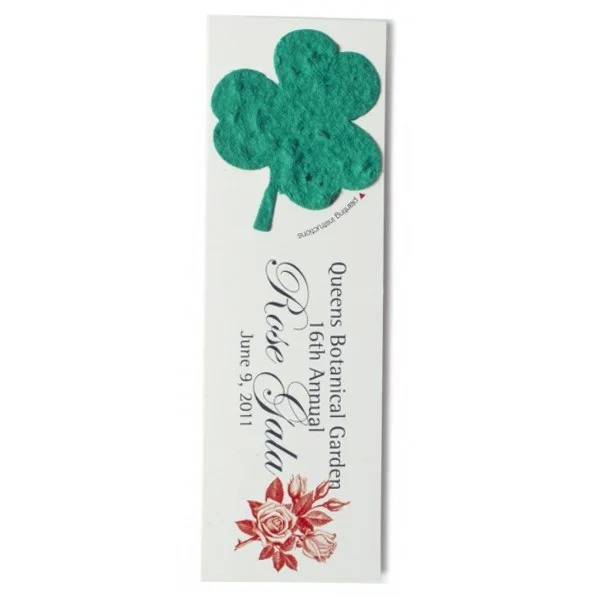 Promote a 4th of July event or sale by customizing your seed paper bookmark order to include our 'Independence Day Mix', a blend of red, white and blue flowers. Use this milestone as a way to encourage your customers to "give back" to the land of our country and take a proactive stance towards global sustainability. Add spooky style to your promotion with our 'Halloween Mix' of pumpkin seeds or welcome the winter holiday season with our popular 'Evergreen Mix'. You can even choose a specialty mix that will bloom with the colors of your brand logo. There's a lot of blooming talent within our team and new specialty and seasonal seed mixes are sprouting up all the time. Be sure to ask your design expert what specialty mixes are currently available for your order!